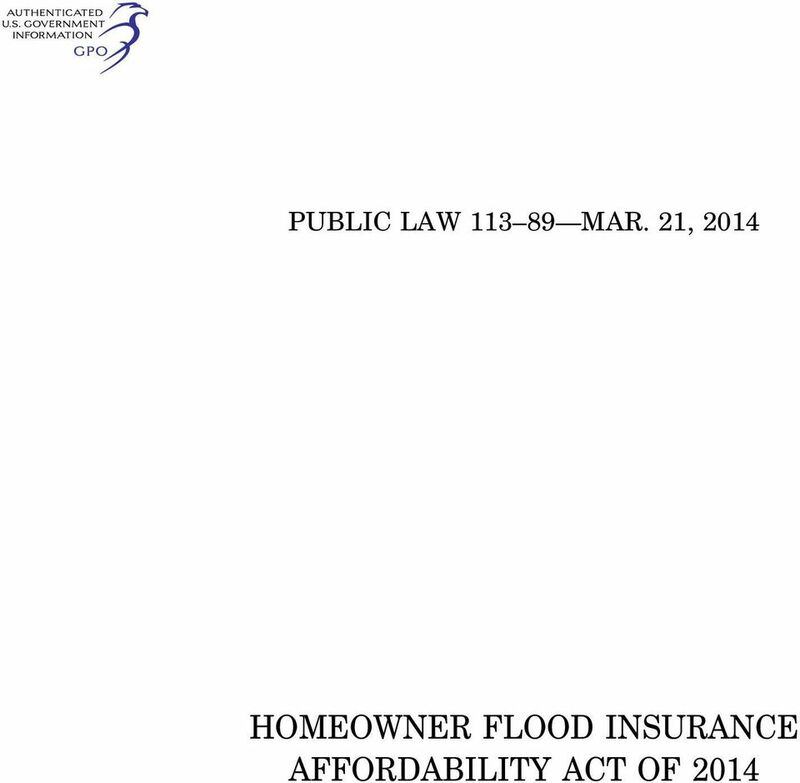 Download "HOMEOWNER FLOOD INSURANCE AFFORDABILITY ACT OF 2014"
3 PUBLIC LAW MAR. 21, STAT SEC. 3. REPEAL OF CERTAIN RATE INCREASES. (a) REPEAL. (1) IN GENERAL. 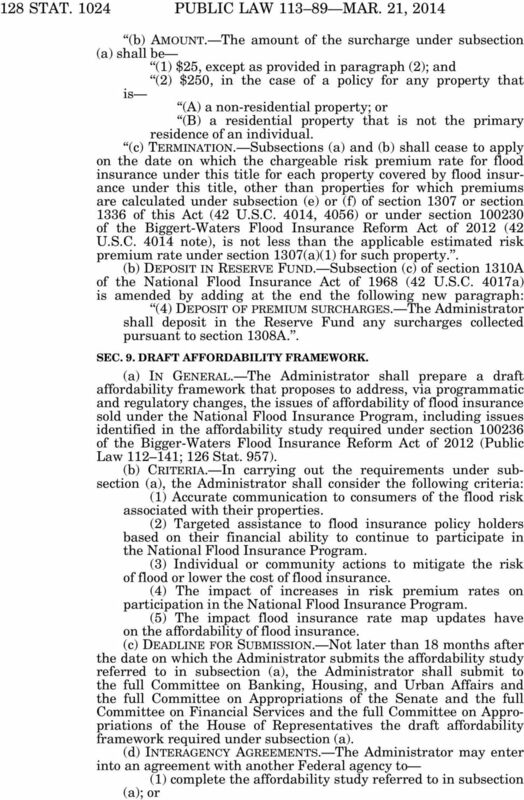 Section 1307(g) of the National Flood Insurance Act of 1968 (42 U.S.C. 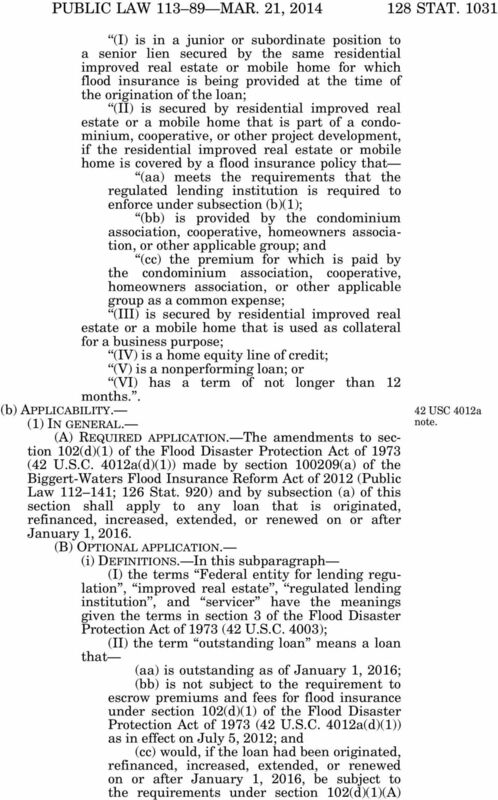 4014(g)) is amended (A) by striking paragraphs (1) and (2); (B) in paragraph (3), by striking as a result of the deliberate choice of the holder of such policy and inserting, unless the decision of the policy holder to permit a lapse in flood insurance coverage was as a result of the property covered by the policy no longer being required to retain such coverage ; and (C) by redesignating paragraphs (3) and (4) as paragraphs (1) and (2), respectively. (2) EFFECTIVE DATE. 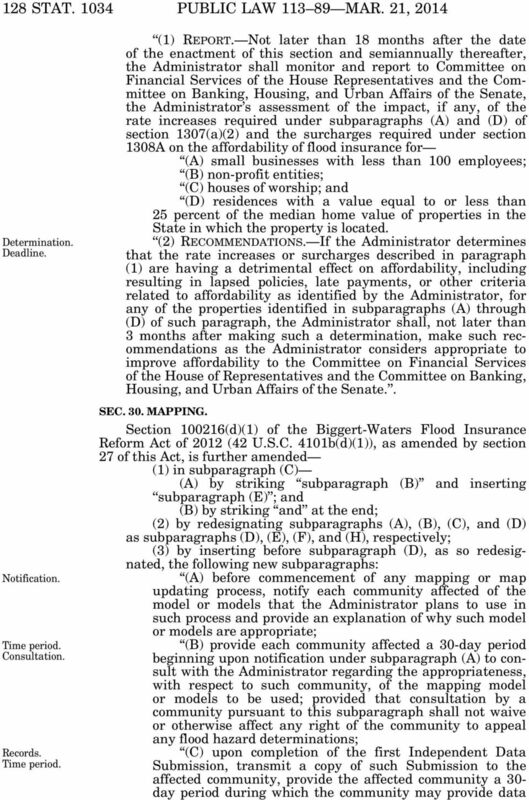 The Administrator shall make available such rate tables, as necessary to implement the amendments made by paragraph (1) as if it were enacted as part of the Biggert-Waters Flood Insurance Reform Act of 2012 (Public Law ; 126 Stat. 957). (3) IMPLEMENTATION, COORDINATION, AND GUIDANCE. (A) FACILITATION OF TIMELY REFUNDS. 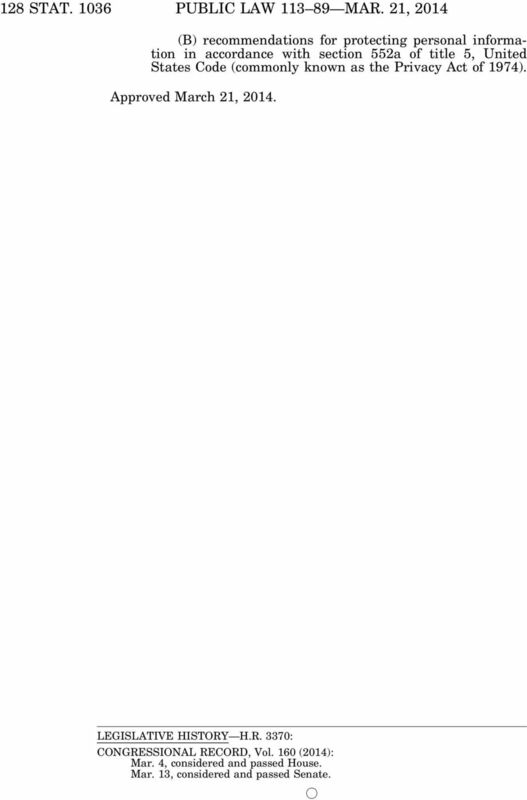 To ensure the participation of Write Your Own companies (as such term is defined in section (a) of the Biggert-Waters Flood Insurance Reform Act of 2012 (42 U.S.C. 4004(a)), the Administrator and the Federal Emergency Management Agency shall consult with Write Your Own companies throughout the development of guidance and rate tables necessary to implement the provisions of and the amendments made by this Act. (B) IMPLEMENTATION AND GUIDANCE. The Administrator shall issue final guidance and rate tables necessary to implement the provisions of and the amendments made by this Act not later than eight months following the date of the enactment of this Act. Write Your Own companies, in coordination with the Federal Emergency Management Agency, shall have not less than six months but not more than eight months following the issuance of such final guidance and rate tables to implement the changes required by such final guidance and rate tables. (4) REFUND OF EXCESS PREMIUM CHARGES COLLECTED. 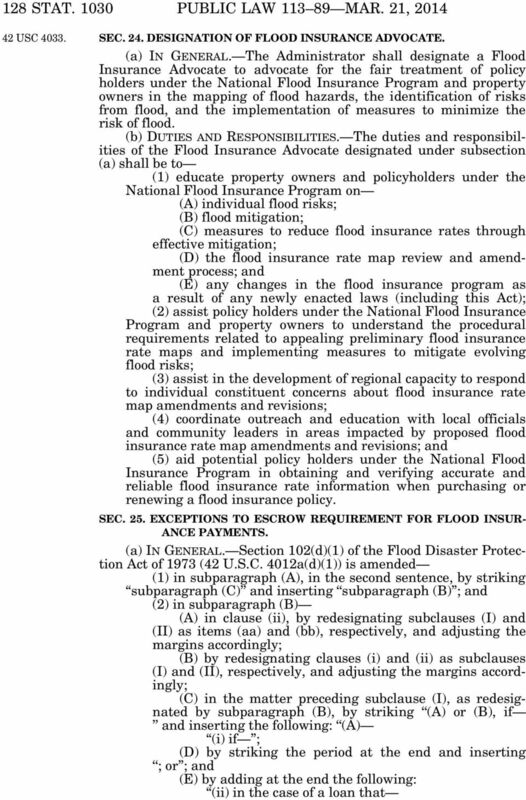 The Administrator shall refund directly to insureds any premiums for flood insurance coverage under the National Flood Insurance Program collected in excess of the rates required under the provisions of and amendments made by this section. 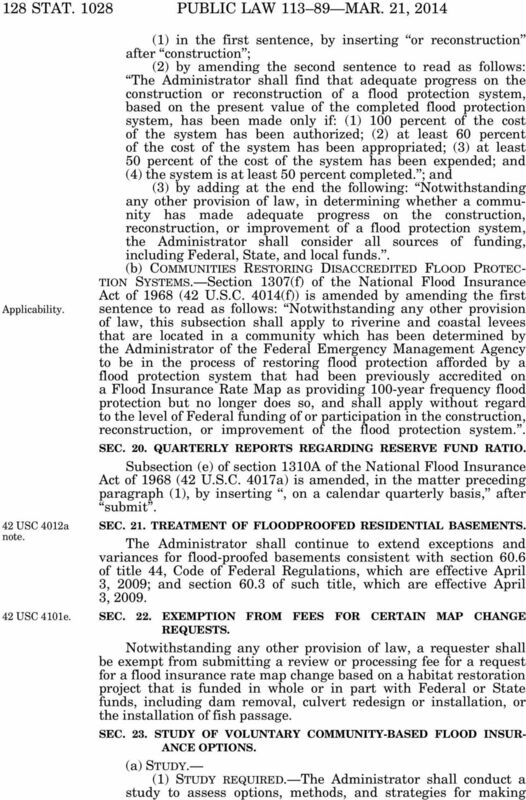 To allow for necessary and appropriate implementation of such provisions and amendments, any premium changes necessary to implement such provisions and amendments, including any such premium refund due to policy holders, which shall be paid directly by the National Flood Insurance Program, shall not be charged or paid to policyholders by the National Flood Insurance Program until after the Administrator issues guidance and makes available such rate tables to implement the provisions of and amendments made by this Act. (b) ASSUMPTION OF POLICIES AT EXISTING PREMIUM RATES. The Administrator shall provide that the purchaser of a property that, as of the date of such purchase, is covered under an existing flood insurance policy under this title may assume such existing policy and coverage for the remainder of the term of the policy VerDate Mar :50 Mar 25, 2014 Jkt PO Frm Fmt 6580 Sfmt 6581 E:\PUBLAW\PUBL PUBL USC 4014 Consultation. Deadline. Time period. 5 PUBLIC LAW MAR. 21, STAT (6) in paragraph (3) (as so redesignated by paragraph (4) of this section), by striking 20 percent and inserting 15 percent ; and (7) in paragraph (4) (as so redesignated) by paragraph (4) of this section), by striking paragraph (1) and inserting paragraph (3). SEC. 6. CLARIFICATION OF RATES FOR PROPERTIES NEWLY MAPPED INTO AREAS WITH SPECIAL FLOOD HAZARDS. 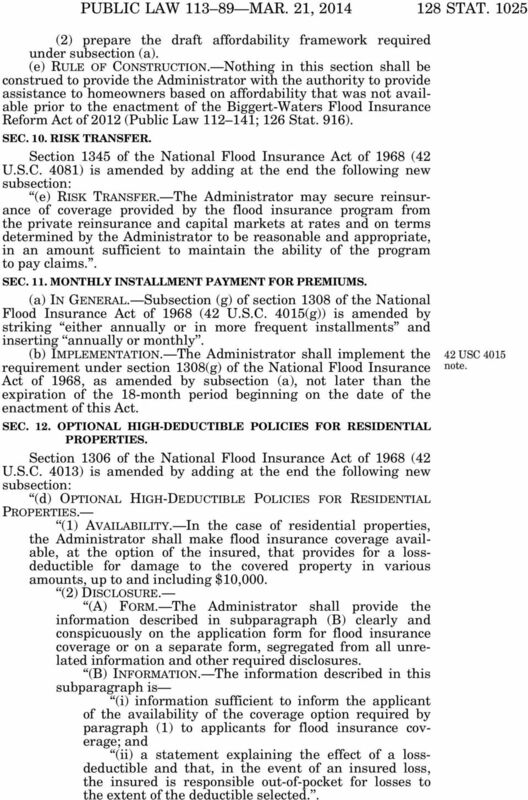 Section 1308 of the National Flood Insurance Act of 1968 (42 U.S.C. 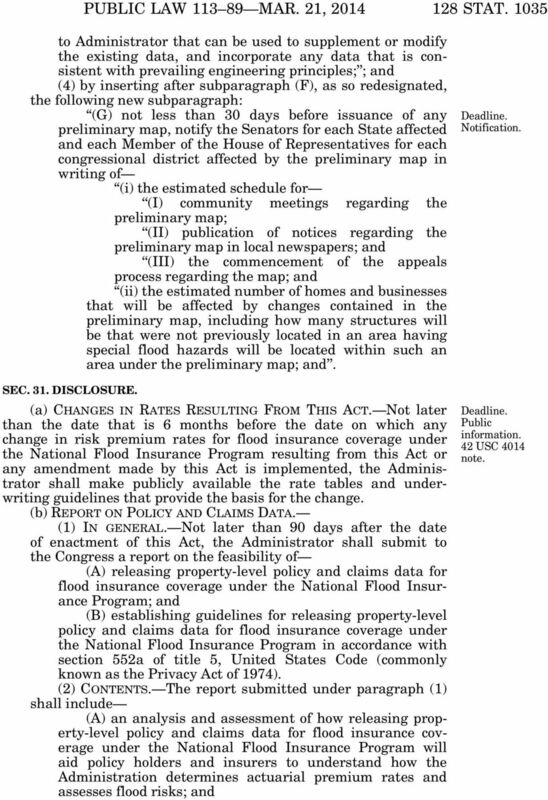 4015), as amended by the preceding provisions of this Act, is further amended by adding at the end the following new subsection: (i) RATES FOR PROPERTIES NEWLY MAPPED INTO AREAS WITH SPECIAL FLOOD HAZARDS. 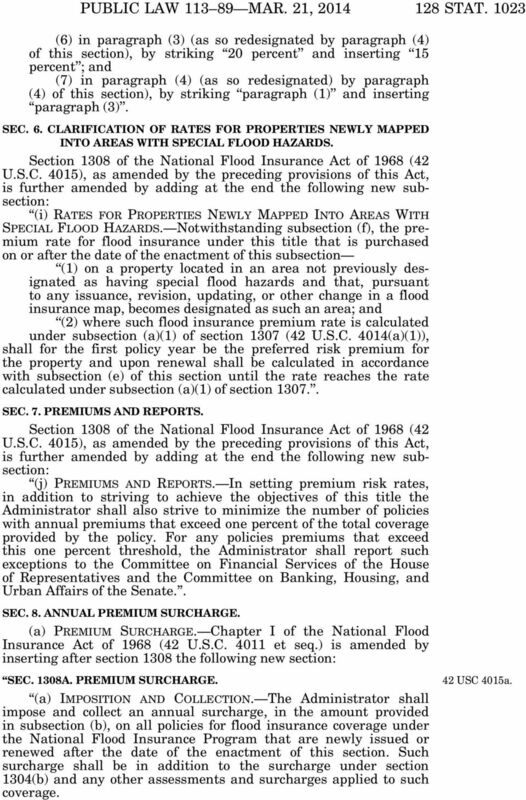 Notwithstanding subsection (f), the premium rate for flood insurance under this title that is purchased on or after the date of the enactment of this subsection (1) on a property located in an area not previously designated as having special flood hazards and that, pursuant to any issuance, revision, updating, or other change in a flood insurance map, becomes designated as such an area; and (2) where such flood insurance premium rate is calculated under subsection (a)(1) of section 1307 (42 U.S.C. 4014(a)(1)), shall for the first policy year be the preferred risk premium for the property and upon renewal shall be calculated in accordance with subsection (e) of this section until the rate reaches the rate calculated under subsection (a)(1) of section SEC. 7. PREMIUMS AND REPORTS. 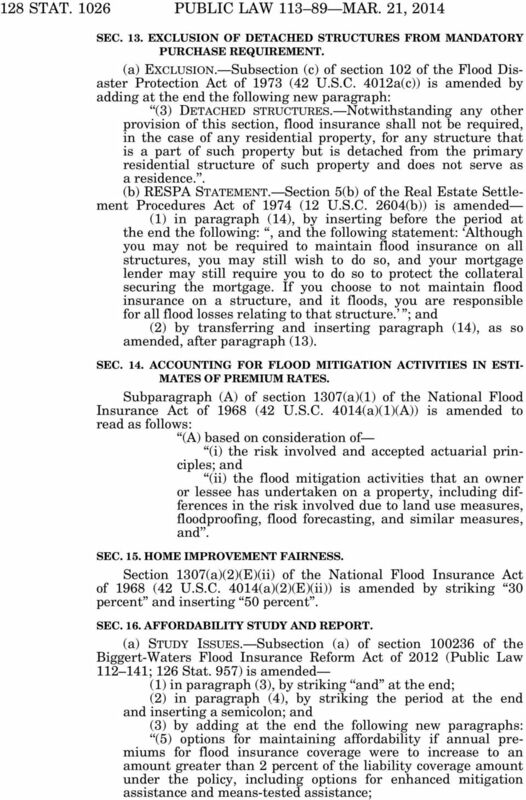 Section 1308 of the National Flood Insurance Act of 1968 (42 U.S.C. 4015), as amended by the preceding provisions of this Act, is further amended by adding at the end the following new subsection: (j) PREMIUMS AND REPORTS. In setting premium risk rates, in addition to striving to achieve the objectives of this title the Administrator shall also strive to minimize the number of policies with annual premiums that exceed one percent of the total coverage provided by the policy. For any policies premiums that exceed this one percent threshold, the Administrator shall report such exceptions to the Committee on Financial Services of the House of Representatives and the Committee on Banking, Housing, and Urban Affairs of the Senate.. SEC. 8. ANNUAL PREMIUM SURCHARGE. (a) PREMIUM SURCHARGE. 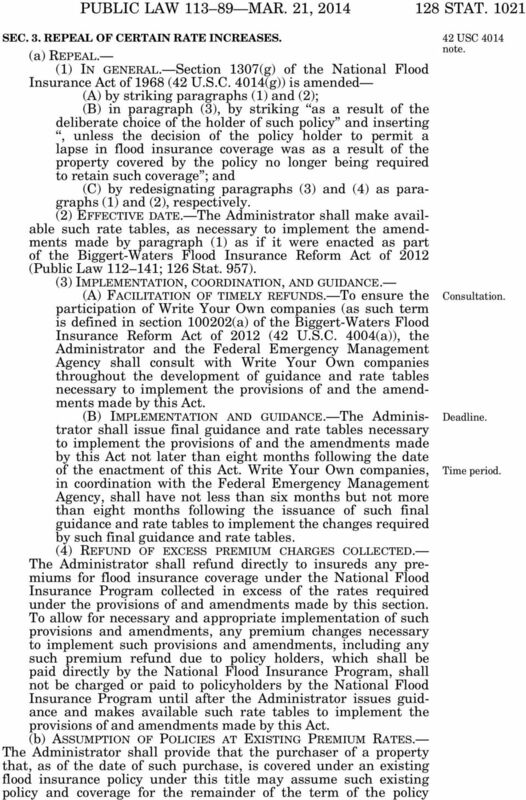 Chapter I of the National Flood Insurance Act of 1968 (42 U.S.C et seq.) is amended by inserting after section 1308 the following new section: SEC. 1308A. PREMIUM SURCHARGE. (a) IMPOSITION AND COLLECTION. 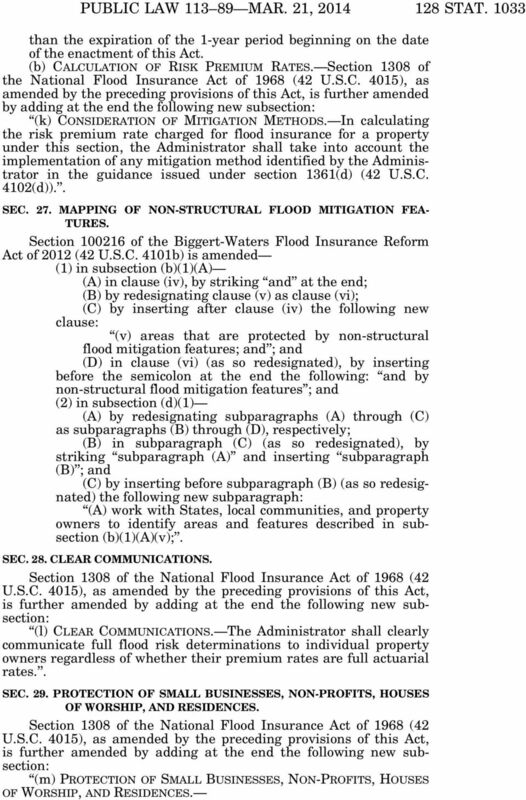 The Administrator shall impose and collect an annual surcharge, in the amount provided in subsection (b), on all policies for flood insurance coverage under the National Flood Insurance Program that are newly issued or renewed after the date of the enactment of this section. Such surcharge shall be in addition to the surcharge under section 1304(b) and any other assessments and surcharges applied to such coverage. VerDate Mar :50 Mar 25, 2014 Jkt PO Frm Fmt 6580 Sfmt 6581 E:\PUBLAW\PUBL PUBL USC 4015a. 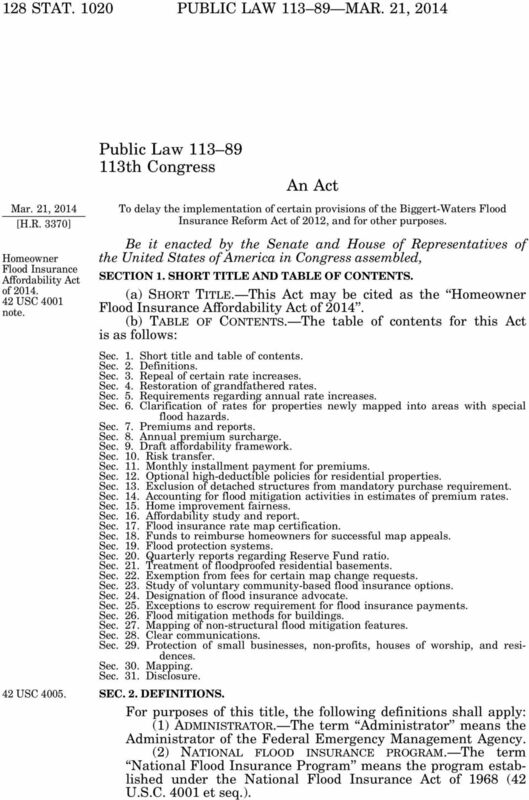 Homeowner Flood Insurance Affordability Act of 2014 Section by Section Summary On March 21, 2014, President Obama signed into law the Homeowner Flood Insurance Affordability Act of 2014 (HIFAA) (P.L. 113-89). 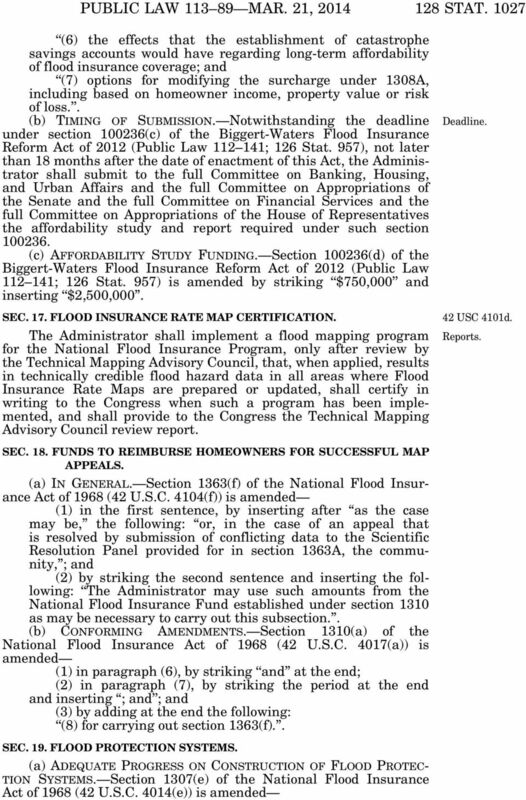 H. R. 4348 512 TITLE II FLOOD INSURANCE Subtitle A Flood Insurance Reform and Modernization SEC. 100201. SHORT TITLE. 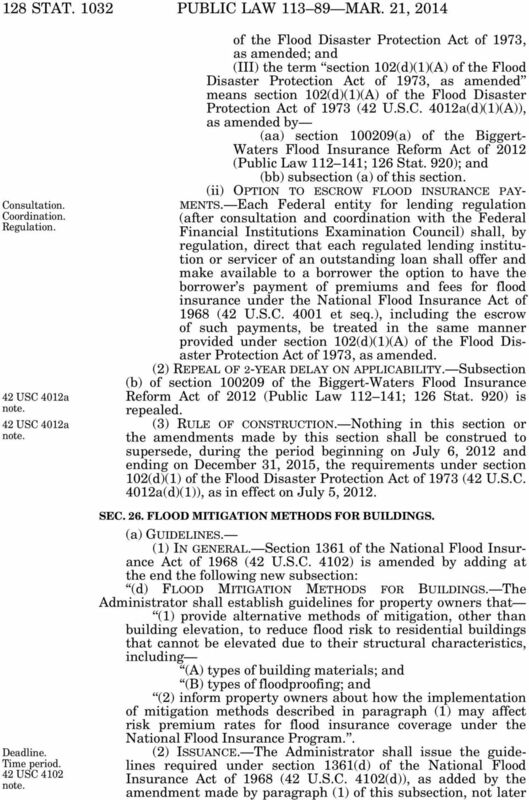 This subtitle may be cited as the Biggert-Waters Flood Insurance Reform Act of 2012. H. R. 1224 AN ACT. To repeal the prohibition on the payment of interest on demand deposits, and for other purposes. 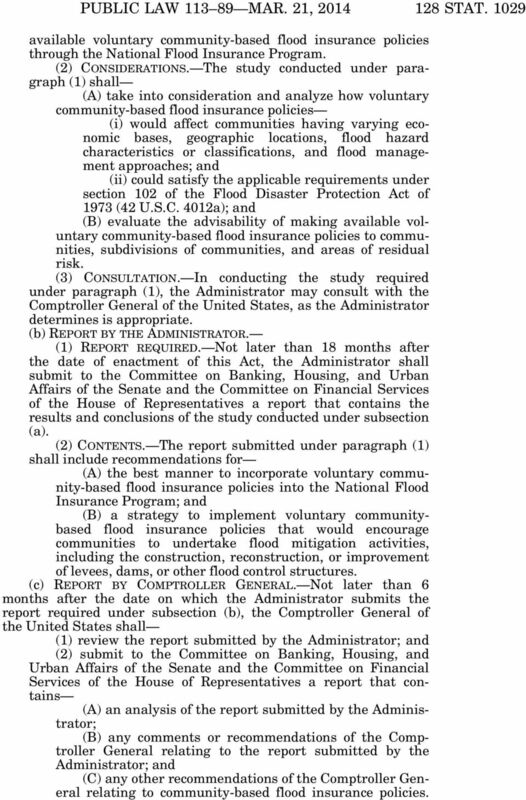 ALL-HAZARD AUTHORITIES OF THE FEDERAL EMERGENCY MANAGEMENT AGENCY THE NATIONAL FLOOD INSURANCE ACT OF 1968, AS AMENDED, AND THE FLOOD DISASTER PROTECTION ACT OF 1973, AS AMENDED 42 U.S.C. 4001 et seq.